April 10,2018 /3BL Media/ - Fast Company has announced the winners of its World Changing Ideas Awards, which honor businesses, policies, projects, and concepts that offer innovative solutions to the issues facing humanity. The Ray’s smart road dot was selected for recognition as a World Changing Ideas finalist. All of the finalists are highlighted in the May issue of the print magazine. The Ray was selected for its creation of never before seen, life-saving technology: a smart road dot. Standard, reflective road dots are deployed commonly across the country and around the world and are usually interspersed with lane lines and markings. The Ray’s smart road dot will use color to communicate critically-important data to drivers in real-time, such as the presence of “black” ice, heavy fog, an accident up ahead, or erratic drivers. The smart road dot has solar-powered LED lights with a backup battery, and autonomous functions enabled by a mesh network that acts in real-time and real-place with data generated from the road surface. The next decade will see a tremendous shift in the way we drive and the technology in our vehicles. The Ray’s smart road dot ensures that the future road is advanced – not just our cars. And perhaps even more important, the smart road dot will level the information playing field between connected and autonomous cars, and “classic” cars. And unlike other smart, connected technologies, the smart road dot will shine in rural and ex-urban communities that are all too often left behind in smart city developments. This innovation marks a shift in how we think about technology development. The smart road dot is one of the first instances of the public, private, philanthropic partnership model (P4) being used to bring to market new, life-saving technology. The Ray is the sole owner of the intellectual property and the holder of all patents. John Picard, Vice President of The Ray, is co-lead on this project. 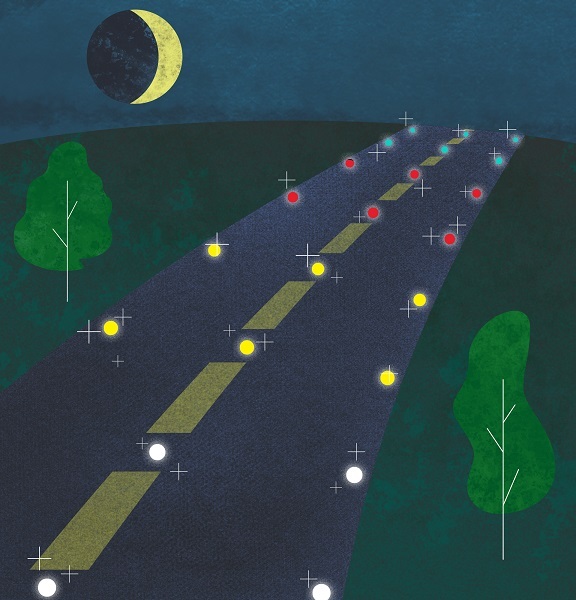 "What we've done is game-changing," said Picard, "No one expects the road itself to be smart. And not only that but through color, we've given the road a way to communicate to all drivers. Real-time Information is key with the smart road dot and it's going to save lives." The Ray and its UK-based consultants at Innovia Technology produced the first prototype of the smart road dot in 2017. The Ray will continue in 2018 to improve all aspects of the unit design to produce a version two prototype, ready for pilot testing and deployment.